Gradually the tears have become less painful, and I'm hoping as I put this new section together it won't be so difficult to work through. While I'm far from being past the CU grieving stage, by now it seems the ideal time to post this page. 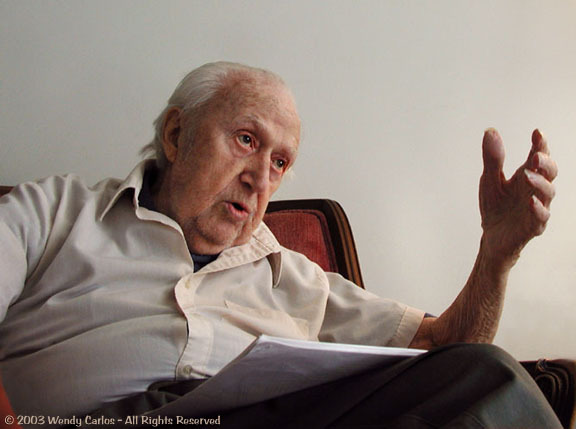 Monday, December 8, 2003, is my dad's 97th birthday. It's a fitting moment to take a moment or two to look back on a good long life, a life that I happened to know quite a bit about. Let me collect some snapshots here, to show you what Clarence J. Carlos looked like during his century, a century he enjoyed asserting contained the greatest changes in human history. Then he'd remind me that when he was a boy automobiles and planes and electricity were brand new, radio, then TV, space exploration, miracles of medicine and the whole field of the CPU were topics of fantasy and science fiction. How could one argue? Click each for a large view in a new window. Close that window to continue here. 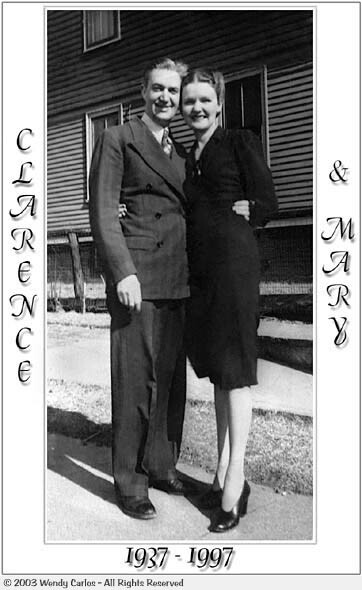 Clarence was the oldest of six children of Charles J. and Rose E. (nee Frasier) Carlos, born on the morning of December 8, 1906, in Chelsea, MA. He was named after his father's older brother, as he recalled to me during one a long recent phone visit. The earliest photo I have of him appears above left. 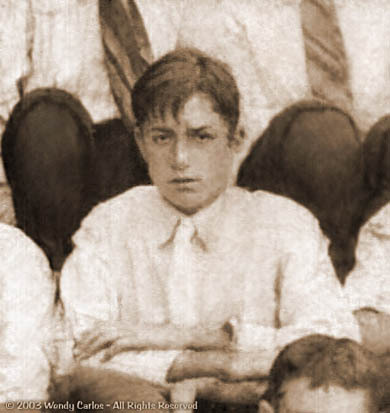 It's a cropped section from a badly faded class photo taken during his last year of formal education, probably in Everett or Plympton, MA. He showed me this wallet photo about eight years ago, and I offered to try to scan and restore it on my Mac, the best I could. Let's start off this section with it. The center photo was taken in the mid-'30s, down near the shoreline of Narragansett, RI. The family liked to spend some time by the ocean each summer. I think someone had the use of a beach cabin once or twice, and the clan trolleyed down to be near sun and surf. After "we kids" started coming along, someone acquired a jalopy, and we'd all pile in for the long drive, singing boisterous strains of "You are my sunshine" and "I'm looking over a four-leaf clover," with an encore of "On top of old Smokey." 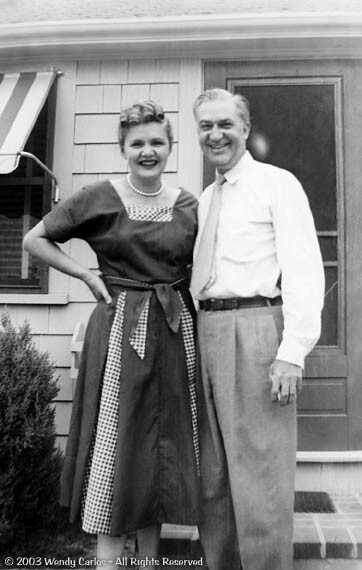 The woman standing next to my dad here is Mrs. Foster (don't know her first name), another warm and spirited family force, rather like my dad's mom, and part of their sprawling circle of mutual support. They must have been close, as he kept this well worn snapshot among several in his wallet right to this year. It's often the case that families seldom take pictures of their daily activities, unless something unusual is going on, a birthday, holiday, wedding, or in the cases above, while on vacation. These snaps date to the summers of 1958 and 1972, respectively. I recall taking the first snapshot myself, with my mom's steadfast Brownie box camera (using a 2-1/4" x 4" film size! 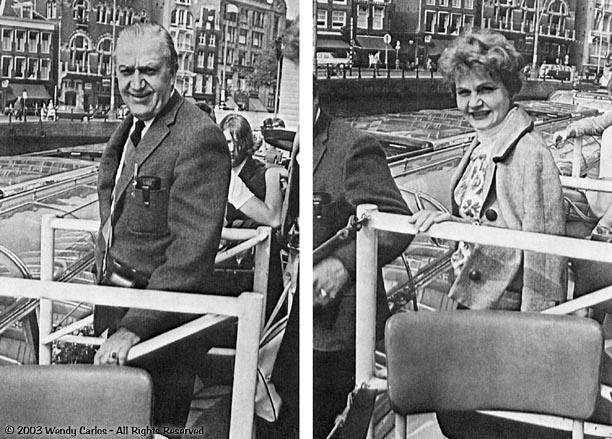 ), a family travel companion during the '50s and early '60s. Often we'd escape the heat of the city during July or August by heading to Cape Cod, not a long drive, yet seemingly a world apart, over those distinctive bridges dedicated to Bourne and Sagamore, then along the cooling ocean or bay. Usually we all got along well, so the grins here are genuine. Jeepers, how formally Americans used to dress, even here for a beachside motel! Deep in conversation - Attention for "Honey"
We now jump three decades to two of the best recent shots I have of my dad. He retired from a small business that his dad and family started in the early years of WW II, after saving for years. It was one of the typical small textile factories that once dotted much of the Northeastern USA, The Globe Narrow Fabrics Company. It was dirty and incredibly noisy to visit, and was earned via dedicated sweat, if not blood. They were a plucky lot, willing to sacrifice whatever it took to keep their small establishment operating. It eventually provided the family with a modest living for three decades. By then textiles were moving elsewhere, first to the South, then offshore. Some of the tasks were creative (new weaving designs and patterns), but it was more often a lot of hard work, not much for my dad to enjoy. But he was mechanically adept, and developed the many skills needed. My dad retired in '72, and completely enjoyed the remaining 31 years of his life. He remained mentally sharp right to the end. You could discuss nearly anything with both of my parents -- they were always curious and levelheaded. Here I snapped him in the middle of a discussion with another friend during a visit shortened due to the 9/11/01 WTC attacks. 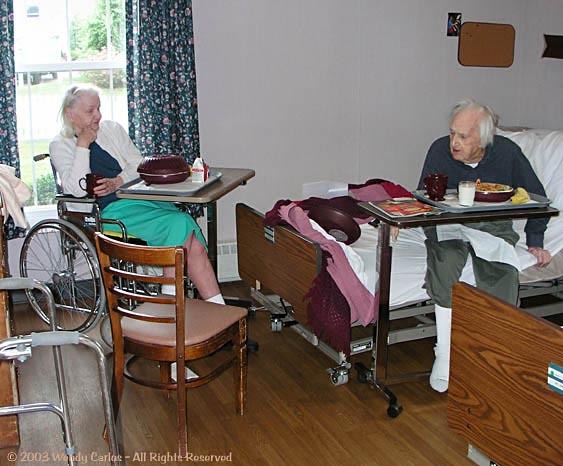 We were in their beautiful assisted care apartment, which my parents moved to in the summer of 2000. I'm grateful to my brother and sister-in-law for finding this place for them, called "The Willows." We chatted and argued emotionally about several topics, including the WTC destruction, so incongruous on this gloriously bright late Summer afternoon, the first day lower Manhattan had been opened up to traffic again. It's a decent photo of him, and perhaps captures his look and spirit those final years better than any other photo I have. Let me close this sampler photo album with the final shots I have of my mom and dad, taken in early July of 2003. This was not a happy time. 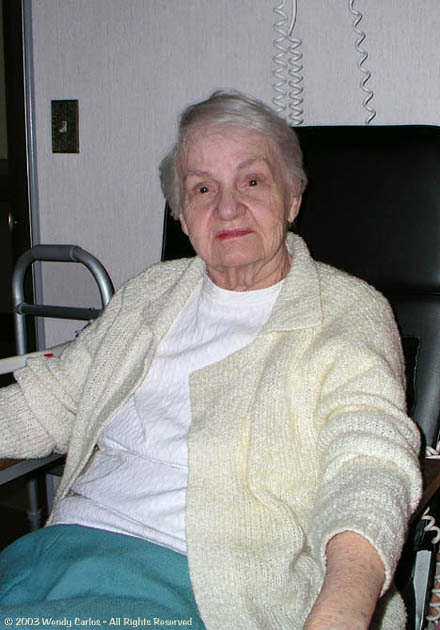 My mom had been recovering from surgery, and had moved across the street from the apartment to recuperate in the nursing home section. My dad managed to hobble across the street to visit with her each afternoon. Then he was hospitalized briefly for dehydration, and joined my mom in the same room. I visited them for several days, and it was to be the last time we shared laughs and chatter "like the old days." But my dad was chafing to get back to his lovely apartment to take care of Honey, too. He got his wish, if only for a few weeks. Johnathan and my brother called -- things had suddenly worsened. Time to rent a car and head on back to RI. As with most parent - child relationships, there had been rough times, but the final two decades of my dad's life we all were unusually close. I spent a few weeks each year with them, also on weekly phone visits. I'm grateful for those years -- we got to know one another better than during the decades before, becoming real friends. Everything comes to an end. My father finally wanted out, and said so often for the last year of his life. On September 20th he got his wish. It took a stumble and fall in the middle of the night, a fractured femur and rib, to pull his own house of cards down on himself. 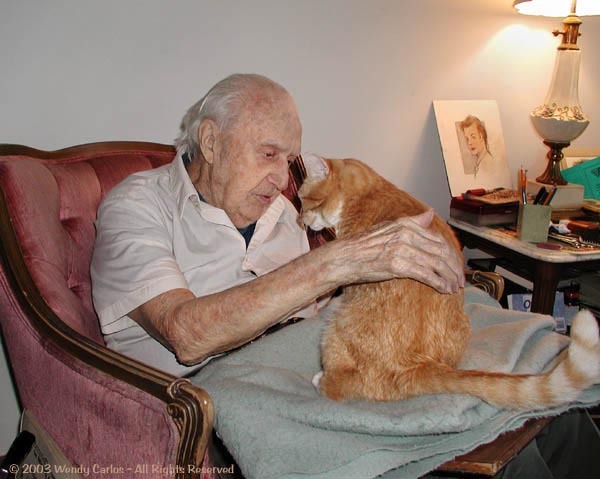 I keep reminding myself of that, and recall his astonished wide-eye look when he whispered loudly several times during the afternoon of our last visit together: "I'm dying!" "Yes, you are," we agreed. He gripped my hand ever so tightly. "You don't have to stay around for us," I confided. "This is what you've been saying over and over that you wanted, dad -- just let go. It'll be all right, darlin'." This was to be our final visit together, the whole family in one large, comfortable room. He'd seen every living friend, neighbor and family member during his final two days. I think the dear old man just wanted to say goodbye to each of us, you know? We went out for dinner nearby, then hurried back. Already he was slipping downward, comfortably. Yes, even in RI they allowed a bit of morphine for the pain from the fractures. He wavered between sleep and awake. We spoke, told him we'd be back in the morning, then left to try to sleep. Shortly before midnight the phone rang beside my bed in the motel room. A very subdued voice, Johnathan's, greeted me. It was over. Both nephews insisted they would wait out however long it took, days or a week. 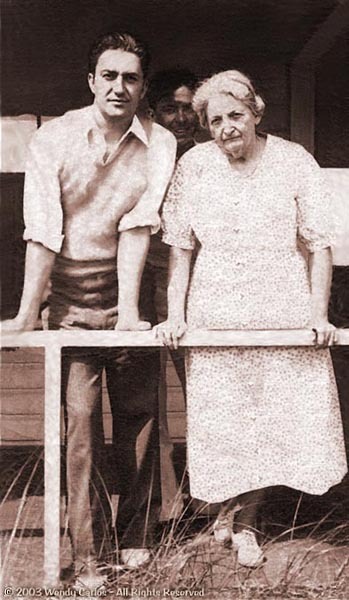 I heard about the final hour and minutes from Johnny, beside him at the very end, along with my mother. A good death, quiet and peaceful. We visited my mom the next morning. She's taking it all very well, better than we are, ever the stoic. I asked her to allow me take a photo of her that she DIDN'T ruin for me this once (by frowning, grimacing, sticking out her tongue, or some such), and got this fine shot of her, sitting quietly as we chatted before I had to head back home with a two-album deadline due that very week. This provided a needed distraction, something real to do, to keep centered. I've procrastinated assembling this page. Despite taking my time until I felt less vulnerable, it turns out it has not been so difficult after all. It has even felt comfortable to put together some of these cherished photos and artwork examples which follow, to describe each informally. I've been very fortunate to have such love and support in my life, from two such dear hearts. There is no bitterness in losing my dad, just the inevitable sadness. Other close friends tell me in time I will not wince so when memories are triggered, and I will merely think: "Gee, they would have enjoyed this," or something like that. One habit is an ouch, as I have to check myself from going to the phone every Sunday, we did it so regularly. but continues on within the thoughts and mind of the survivor." I'm sorry that I don't have very many of his drawings. My brother and his wife told me that they had saved what they could find, and eventually I'll check through what they have preserved. During the many visits with my parents during the past two decades my dad occasionally would suddenly hand me several drawings to take home as souvenirs. I hated to take his only copies, which had so many memories, but also was glad to have examples that my dad was a talented artist (he modestly considered himself only mediocre). Around the house were to be found constructions of various kinds, pastels and paintings, carved wooden figures, props, even some beautifully built clever action board games he had invented (Parker Bros. and Hasbro were not interested, alas). The two pencil drawings here are typical of many from the years around WW II. Since my dad loved animals so much, it was inevitable that he try his hand on wild or tame animal life. 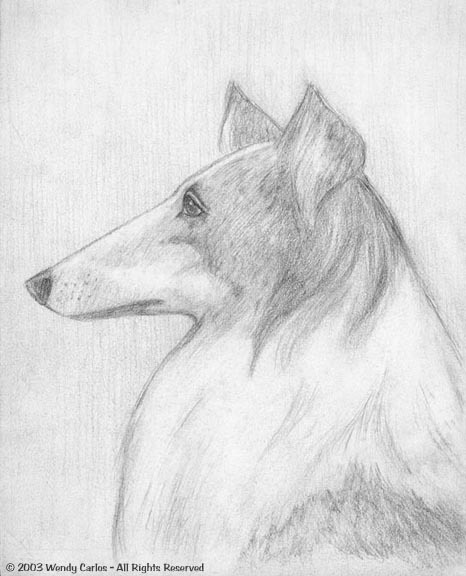 "Lassie," the film-star collie, appears in this drawing on Bristol board (his fave) using graphite pencils. It's about 10" tall. To the right is his portrait of film star Ava Gardner. It's a decent resemblance (he studied several magazine photos), while the actual pose and details are something he came up with out of his head (he respected those artists who could draw directly from mind and memory). 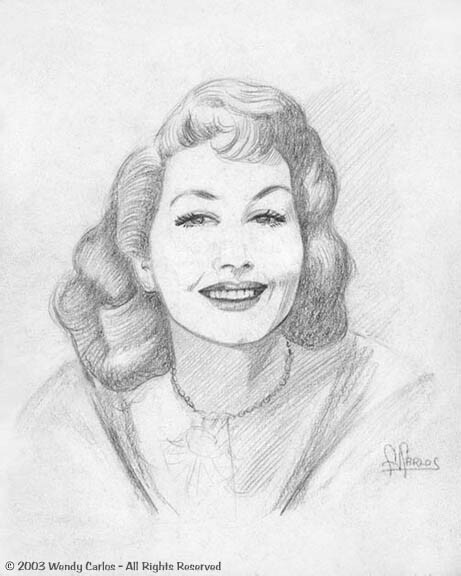 Pencil sketches were my father's favorite medium -- their ease of correction, speed to the finished product (his art was created during usually stolen moments). 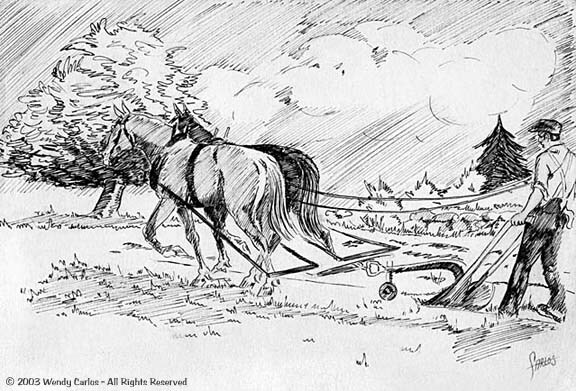 My dad also admired fine pen and ink work. It's a much more difficult medium than it may first appear. The line must be drawn with steady delicacy and control. It's also unforgiving in the extreme -- if you blow it, you'll probably have to begin again. White-out always looked patched-up, and razor-blade ink removal is itself a practiced skill. You learn to make an underlying pencil version to work out your ideas, then trace over the sketch with a nibbed pen and some good India Ink. 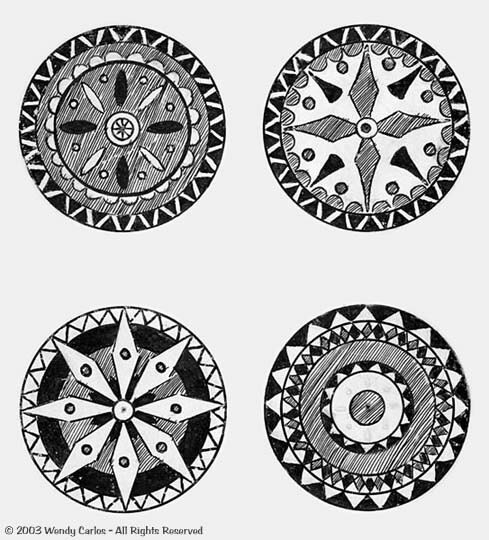 When that's dry, you might add brush work (like water colors), or fill in bolder areas and lines with "Speedball" type pens, which have wider widths in many shapes and sizes. When everything's dry you erase the underlying pencil work, although my dad often preferred to leave it there, a ghost of the initial stages. Many later drawings also contain poetry and verse. He was sad that poetry seemed buried by films, radio, television. It was very "alive" and popular during his youth --he could still recite many poems by heart. He loved to play with words, and came up with simple verses or narrative poems. 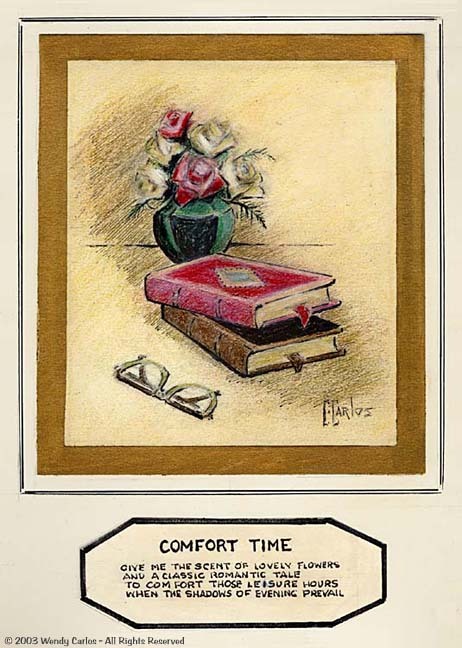 Some were featured in oversized book form, with hand cut cards containing the narratives, other cards the illustrations. You could enjoy the interplay of image, word, and layout, in these custom books. They would have made grand children's books. But only the family and friends ever saw the charming creations that he seemed come up with spontaneously. My dad came up with two major insights for graphic layout, structures which would assure that the results held together and "grabbed" the eye. The first was that longer shapes, like a flower on a stem, a standing human figure, even the path of a shadow, were particularly graceful and less static if given a subtle "S" curve. The second insight, shown here, is that you ought position your dominant objects along a diagonal path, here from top left to bottom right. He said that many talented beginners followed these ideas naturally, and even great photographs often contained similar rules. These are two lovely perceptions, I think, something to be aware of, even when you have to make an exception (which would then "prove" the rule). Let's close this section with a different medium: paper mache construction. These are photos I took right now of a parrot hand puppet. My dad created this as part of the props for one of the plays my mom and he put on during one of those Florida plays. They'd made a full pirate's costume, including the kind of hat, peg-leg and eye patch featured in films like Treasure Island. The story was a parody of those cliches, a clever way to entertain the bored seniors, and provide some of them a chance to perform on stage. 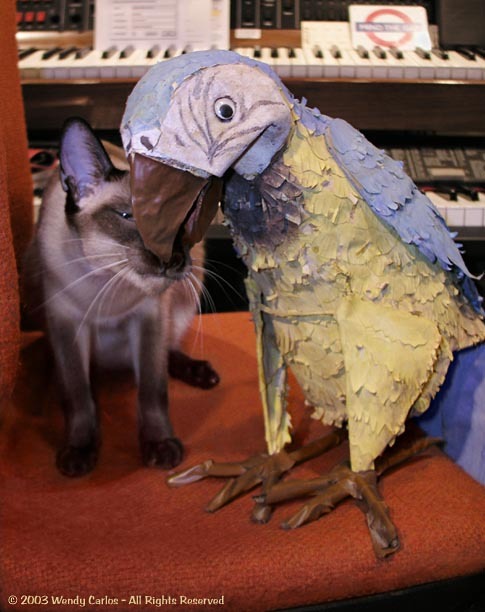 The "pirate" slid his hand up into the base of the parrot, although you scarcely notice the opening. 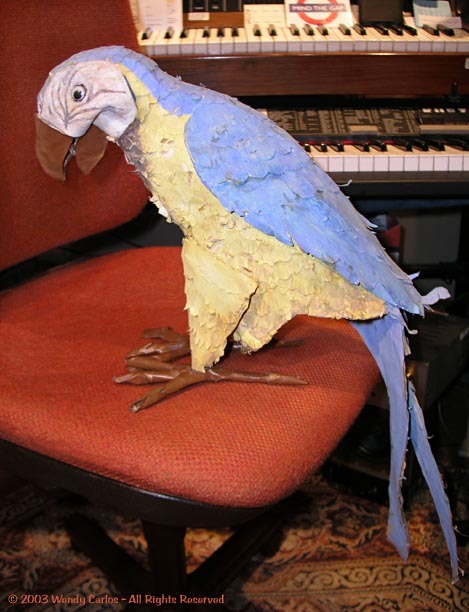 Inside were pull tabs for wires and strings which moved the parrot's head, beak, and tongue. Tabs made the wings flap, and the whole body could swivel, bobbing the head up and down. Pretty dern cute. Dad -- this page is for you!